On the planet of Krypton, Lara Lor-Van (Ayelet Zurer) delivered a baby son (through natural childbirth) - with her husband Jor-El (Russell Crowe) assisting. Chief advisor Jor-El appeared before Kryptonite leaders in Kandor to warn of the unstable planet's impending self-destructive doom, and the exhaustion of resources from the planet's core: "Do you not understand? Krypton's core is collapsing. We may only have a matter of weeks. I warned you. Harvesting the core was suicide. It has accelerated the process of implosion." He proposed a hopeful solution - to search for other worlds: "Look to the stars, like our ancestors did. There are habitable worlds within reach. We can begin by using the old outposts...Give me control of the Codex. I will ensure the survival of our race." He desired control of the planet's 'Codex' [Note: The Codex, or Growth Codex, was a skull that contained the genetic information for the entire Kryptonian race.] But the Kryptonian Law Council refused to listen and dismissed his claims. Suddenly, General Zod (Michael Shannon) and his armed, loyalist Rebel followers instigated a coup d'etat. They killed guards and one of the lead council members, then announced the disbanding of the government and the arrest of its leaders. Zod implored Jor-El, his childhood friend, to join his movement: "Join me. Help me save our race. We'll start anew." Zod argued for seizing the 'Codex' that had genetically imprinted and predeterminedly decided the societal roles and fates of all newborns - to eliminate what he called "degenerative bloodlines." Jor-El refused to cooperate with Zod: "I will honor the man you once were, Zod, not this monster you've become." Jor-El was immediately arrested, but soon overtook his captors. He communicated with his wife Lara via Kelex, to warn and prepare for what was coming: "You have to ready the launch." Jor-El fled on his flying, 4-winged pet H'Raka to the Genesis Chamber (the planet's liquid birthing chamber) atop the Central Hub, where Jor-El successfully stole the Codex, and although attacked by Zod's forces, he flew home. He questioned Lara about a suitable alternative world: "Did you find a world?" She responded that they would send their newborn son from Krypton to a "young star" known as Earth (with a yellow sun) in a small spacecraft. Lara was saddened and worried: "He'll be an outcast. A freak. They'll kill him." Jor-El thought otherwise - he would be invulnerable and all-powerful: "He'll be a god to them....Out there amongst the stars, he will live." The Codex and a small portable, metallic Command Key (with a shield-shaped "S" imprinted on it) were also put inside the capsule. The Codex's genetic information was bonded to the newborn's individual cells, to preserve his Krypton legacy. As they readied the launch of the space pod, five Zod attack ships approached. Just as the pod was about to launch, Zod again came face to face with Jor-El and demanded the purloined Codex that would inevitably doom the Kryptonian race: "I know you stole the Codex, Jor-El. Surrender it and I'll let you live." Jor-El asserted it was inside his newborn son's pod: "This is a second chance for all of Krypton, not just the bloodlines you deem worthy...We've had a child, Zod. A boy child. Krypton's first natural birth in centuries. And he will be free. Free to forge his own destiny." Enraged, Zod attacked Jor-El and ordered the pod to be shot down, just as Lara engaged the pod's engines and it shot into the sky. Zod stabbed Zor-El to death with a huge sword-blade that emerged from his armor. Lara announced her newborn son's name: "His name is Kal, son of El. And he's beyond your reach." Zod's commands were nullified when Kryptonian security ships surrounded Zod's followers and destroyed one of his attacking vessels as the small pod rocketed away. Zod and his captured forces were brought before a trial Law Council - they were sentenced and banished for 300 years inside the Phantom Zone: "General Zod - for the crimes of murder and high treason, the Council has sentenced you and your fellow insurgents to three hundred cycles of somatic reconditioning." Furious, Zod lashed out at witness Lara: "You believe your son is safe? I will find him. I will reclaim what you have taken from us. I will find him. I will find him, Lara." Zod and his cohorts were encased and then boarded onto a giant craft known as the Black Zero, before being sent to the Phantom Zone. Shortly thereafter, Zor-El's predictions about the implosion of Krypton's core came to pass. Lara passively watched as the planet erupted and broke apart, and she was consumed. Kal-El's space pod approached planet Earth's atmosphere before touching down. FlashForward: Years later onboard the crabbing Debbie Sue vessel in Alaska was a bearded, greenhorn co-worker (later identified as Clark Kent) (Henry Cavill) who was inattentive to his deck duties. A distress call alerted the crew to a nearby oil rig in flames. Moments later, the man disappeared and was seen on the rig - shirtless and on fire! He rescued the crew and assisted them on boarding a US Coast Guard chopper from the rig's helipad before the entire oil rig collapsed. He then disappeared into the wreckage and floated unconscious in the water. The adult bearded man from the oil rig miraculously reappeared on land and stole some clothes from the back of a car before running off. In town, as he watched a school bus pass nearby, he again experienced another flashback to his youth. [Flashback: While 13 year-old Clark Kent (Dylan Sprayberry) was riding on a schoolbus and being bullied by teenaged classmate Pete Ross (Joseph Cranford), the bus had a flat tire as it was crossing a bridge, and it careened over the side into a deep body of water. Clark escaped through the rear emergency door, and saved the driver and other children from drowning by lifting the bus and pushing it to shore. But because of the rescue, he revealed his super-powered strength to young Lana Lang (Jadin Gould) and to the bully. Later, his father Jonathan Kent (Kevin Costner) and mother had to explain away the miracle to Pete's astonished and suspicious mother ("This isn't the first time Clark's done something like this"). Jonathan spoke privately to his conflicted son Clark, to express his concern and urge him to suppress his powers: "Clark, you have to keep this side of yourself a secret... When the world finds out what you can do, it's gonna change everything. Our, our beliefs, our notions of what it means to be human. Everything." At the Cassidy pub highway bar in Canada, the bearded man (working as bartender) overheard a conversation between patrons about the military's AirCom search under ice-bound Ellesmere Island for an "anomalous object" that was emitting an alien signal, detected by NASA. When taunted by a rude bar customer named Ludlow (Ian Tracey) for harrassing waitress-friend Chrissy (Carmen Lavigne), Clark accepted the insults and then calmly left the bar and never returned. Later, Ludlow discovered that his logging truck had been upended and impaled by its own load. The bearded man hitchhiked northward in the direction of Ellesmere Island. Sometime later, Clark was identified as "Joe" - and seen assisting Daily Planet investigative reporter Lois Lane (Amy Adams) as she exited a helicopter, and he was asked to carry her luggage. Arriving a day early, she was introduced to US Northern Command's Colonel Nathan Hardy (Christopher Meloni) from the US Air Force, and Dr. Emil Hamilton (Richard Schiff), a scientist from DARPA (Defense Advanced Research Projects Agency), an agency in the Dept. of Defense tasked with developing military technology. Obviously unwelcome by the two secretive officials, Lois was briefed about the Arctic site - there was an object about 300 meters deep in the frigid water and surrounded by ancient ice ("The ice surrounding the object, it's nearly twenty thousand years old"). That evening, as she wandered outside to take pictures, her camera caught sight of a man outdoors without cold-weather clothing. When she got closer, she came upon an ice tunnel bored through the thick ice by "Joe's"/Clark's heat-vision. As she explored, he encountered an ancient Kryptonian pioneer or scout ship or spacecraft that had crash-landed years earlier, but had been covered over by ice and snow. Clark removed a necklace holding the Command Key (with the "S" insignia) given to him years earlier by his adoptive father Jonathan, and was initially attacked by the ship's defensive sentry. When he fully inserted the Command Key into a slot in the Arctic ship's central control system, the sentry ceased its attack. He was able to conjure up a projected, holographic AI vision of an unidentified figure (his real father Jor-El) who kept walking away without speaking. Nearby, the eavesdropping Lois also alerted the ship's sentry who attacked her when she took its picture. Clark came to her rescue when she screamed, and crushed and dismantled the sentry with his bare hands. With his heat vision, he cauterized Lois' lower abdomen wound (she was hemorrhaging internally) caused by the sentry, cryptically explaining: "I can do things that other people can't." In the control room at the camp site, alarms sounded and computer monitors recorded intense shaking - officials watched as the ice cracked open and the giant ship flew away to a new location. (voice-over) What Colonel Hardy and his team surmised was a Soviet-era submarine was actually something much more exotic. An isotope analysis of the surrounding ice bores suggests that an object had been trapped in the glacier for over 18,000 years. As for my rescuer? He disappeared during the object's departure. A background check revealed that his work history and identity had been falsified. The questions raised by my rescuer's existence are frightening to contemplate but I also know what I saw. (in person) And I have arrived at the inescapable conclusion that the object and its occupant did not originate on Earth. The Daily Planet's editor-in-chief, her boss Perry White (Laurence Fishburne), refused to publish his Pulitzer Prize-winning reporter's account, calling it a possibly-hallucinated memory of "aliens walking among us." Even the Pentagon predictably denied there was such a ship. To get her story into the paper, Lois leaked her story online to one of her contacts, notorious Internet blogger Glen Woodburn (Chad Krowchuk). She explained her motivation and rationale: "Because I want my mystery man to know I know the truth." Your mother and I believed Krypton lost something precious. The element of choice, of chance. What if a child dreamed of becoming something other than what society had intended for him or her? What if a child aspired to something greater? You were the embodiment of that belief, Kal. Krypton's first natural birth in centuries. That's why we risked so much to save you....You're as much a child of Earth now as you are of Krypton. You can embody the best of both worlds. Earth's sun is younger and brighter than Krypton's was. Your cells have drunken its radiation, strengthening your muscles, your skin, your senses. Earth's gravity is weaker, yet its atmosphere is more nourishing. You've grown stronger here than I ever could have imagined. The only way to know how strong is to keep testing your limits. Kal-El was commissioned to give the people of Earth "an ideal to strive towards...help them accomplish wonders." Outside the ship, Clark tested his flying powers, and after failing to control his movements, he realized that he could fly at supersonic speeds around the world and into outer space. Meanwhile, Lois began trying to intensively track down her "mystery man" from the Arctic base ("Joe"), and discovered his contacts with Chrissy at the Alaskan bar, with the crab boat manager, the US Coast Guard pilot at the oil rig, and with bullying school-bus classmate Pete Ross. Her search eventually brought her to the Kent family farmhouse in Smallville, Kansas. Lois visited the Smallville cemetery and the grave of Jonathan Kent who had died in 1997 at the age of 46, where Clark suddenly appeared behind her. She requested: "Let me tell your story," because she felt that everyone would find out about him eventually, but he refused, citing his father Jonathan's wishes to not reveal himself until the world was ready: "My father believed that if the world found out who I really was, they'd reject me out of fear." After hearing Clark's story, Lois did not pursue her story any further and kept his secret safe. Lois returned to her office and informed Perry White that she was dropping her story, because her leads had panned out. Not really believing her, nonetheless, he lambasted her for her leaked blog story, and reprimanded her with three weeks leave without pay. He expressed an understanding of her desires to keep her revelations a secret: "Can you imagine how people on this planet would react if they knew there was someone like this out there?" Shortly following his meeting with Lois, Clark (now approximately 33 years old) returned to his mother in Smallville, and was reunited after years of searching for himself by taking odd jobs, traveling, and assuming various aliases. To calm Martha, he told her the reporter was "a friend." He was ecstatic and shared news of his heritage: "I found them....My parents. My People. I know where I come from now." He assured her that he wouldn't be taken from her again: "I'm not going anywhere, Mom." At NORAD's NorthCom Command Center, Deputy Commander Lieutenant General Calvin Swanwick (Harry Lennix) was briefed by Dr. Emil Hamilton about the sighting of a strange, non-communicative alien spacecraft that had "inserted itself into a lunar synchronous orbit." The employees of the Daily Planet were alerted to a CNN Breaking News report of a UFO sighting: "Amateur Video From Witnesses on the Ground - Widespread Reports of Unidentified Objects." In Smallville, Kansas, Martha alerted Clark to a night-sky sighting of the UFO hovering nearby. [Note: It appeared that the scout ship that Kal-El had activated and taken to a new remote location had sent out a distress signal that was identified by Zod's Black Zero spacecraft, and clued him into Kal-El's location in the universe. Zod's Black Zero craft and other drop ships were the UFOs being reported.] Various parts of the United States lost electrical power. My name is General Zod. I come from a world far from yours. I have journeyed across an ocean of stars to reach you. For some time, your world has sheltered one of my citizens. I request that you return this individual to my custody. For reasons unknown, he has chosen to keep his existence a secret from you. He will have made efforts to blend in. He will look like you. But he is not one of you. To those of you who may know of his current location, the fate of your planet rests in your hands. To Kal-El, I say this: Surrender within 24 hours or watch this world suffer the consequences. During an interview, Glenn Woodburn spoke of the search for "Kal-El" and haphazardly mentioned: "The Daily Planet's Lois Lane knows who this guy is." While Lois was on the phone with Perry White, FBI agents (led by Colonel Nathan Hardy) surrounded her Metropolis apartment, arrested her when she fled, and took her into custody. In Smallville, Clark entered the local church, and was thinking about speaking to the local priest Father Leone (Coburn Goss). Clark admitted to Father Leone that he was the one General Zod was looking for, and offered to give himself up to save humanity: "If there's a chance, I can save Earth by turning myself in, shouldn't I take it?" However, Clark was conflicted - he realized that both Zod and even humans couldn't necessarily be trusted. Leone advised: "Sometimes you have to take a leap of faith first. The trust part comes later." Costumed with his father's red and blue suit with the S insignia on his chest, Clark descended into the Peterson Air Force Base and surrendered himself. However, as a condition of his surrender, he requested of General Swanwick that Lois Lane be freed in exchange. Ineffectually handcuffed and without resistance, he was marched to an interrogation room where he briefly spoke to Lois. She asked two questions: "Why are you surrendering to Zod?" and "What's the S stand for?" He explained he was only surrendering to "mankind," and that it wasn't an S, but a Kryptonian symbol for hope. She was interrupted by audible voices heard behind a two-way mirror, as she suggested a title: "Super---." Using X-ray vision, he identified those listening in: General Swanwick, Colonel Hardy and Dr. Emil Hamilton. After snapping his handcuffs, he assured them that he wasn't their enemy, but that he would allow them to hand him over to Zod. In a stretch of flat and remote desert, a sonic boom announced the arrival of General Zod's drop-ship spacecraft - out of which emerged Zod's loyal second-in-command Faora-Ul (Antje Traue). She spoke to General Swanwick about apprehending Kal-El - and Lois as well. Although Swanwick resisted, Lois volunteered to accompany Clark as another hostage. After they boarded the drop ship, Kal-El was able to secretly slip the metallic House of El Command Key into Lois' hand. To counteract the toxic atmospheric conditions of Zod's command ship, the Black Zero, Lois was required to wear a breathing apparatus visor. Onboard the Black Zero, it was Kal-El who reported feeling strange. He weakened, coughed, and collapsed to the floor - unused to the Kryptonian atmosphere (Zod: "Whatever's happening to him has to run its course"). After awakening, Superman heard Zod admit to killing Jor-El: "And not a day goes by where it doesn't haunt me. But if I had to do it again, I would. I have a duty to my people and I will not allow anyone to prevent me from carrying it out." Two smaller drop-ships were detected departing from the orbiting alien ship, the Black Zero. Swanwick tracked their aggressive moments as they zeroed in on Kansas - on a mission to retrieve Kal-El's Spaceship and the Growth Codex. Meanwhile, Zod's renegade Kryptonian scientist Jax-Ur (Mackenzie Gray) strapped down and tortured Superman to probe his mind. He also reminded Kal-El that in the Kryptonite environment of the ship, he was "as weak as a human," as he took a blood sample. The sample was intended to extract Kal-El's DNA, to create Kryptonian colonists who would destroy humanity and build a new Kryptonite society based on Zod's ideals of genetic purity. In another area of the ship, Lois was placed in a holding cell by Faora-Ul. Lois inserted the Command Key into a slot in a control panel, and Jor-El's uploaded holographic image appeared to her. He modified the ship's "atmospheric composition to human compatibility" - to return Kal-El's strength. And he offered information about how to stop Zod and send him and his followers back to the Phantom Zone. Lois' breathing apparatus was deactivated, and she retrieved the Command Key, before he led her to an escape pod. At the same time, Kal-El's strength returned and he broke his bonds, causing Jax-Ur to retreat in fear with the blood sample. As Lois entered the pod, a guard shot at her and missed, but damaged the pod as it was launched. Jor-El also appeared to Kal-El, alerting him to the fact that Lois needed to be saved. He flew to the flaming pod and safely extracted her before it burned up upon reentry to Earth and crash-landed in a rural Kansas field. He left her there, to attend to other pressing matters. After landing two drop-ships at the Kent's Smallville farm property, Zod and Faora-Ul confronted Martha and demanded to know the location of Kal-El's spacecraft. It was located in the barn, but they also wanted the Codex, and destroyed the Kent farmhome in anger and threatened Martha when they couldn't find it. Kal-El raced to rescue his mother - he flew into Zod and tackled him with such speed that the two smashed through silos and landed in downtown Smallville. Zod realized that his face-mask had been damaged, and he began to weaken - disoriented in the Earth's atmosphere. Now debilitated with sensory overload (hearing, vision, etc. ), the stunned Zod retreated to his ship. On the main street of Smallville, Faora-Ul and a larger Kryptonian alien known as Nam-Ek (a CGI creation) faced down Kal-El. At the same time, US military jet fighters and helicopters commanded by Colonel Hardy were dispatched to the farm town and fired missiles at all three aliens. Nam-Ek jumped onto one of the jet cockpits and completely destroyed the aircraft. Although Kal-El was quickly outmatched by Faora-Ul, he then began to overpower his opponents, although their brawling caused immense destruction of the town's buildings. The two aliens were forced to retreat to a dropship when Faora-Ul's visor was damaged and she experienced sensory overload. Colonel Hardy, who had been saved by Kal-El, acknowledged to his troopers that Kal-El/Superman was not their enemy. Jax-Ur: It was never in the capsule. Jor-El took the Codex --- the DNA of a billion people, then he bonded it within his son's individual cells. All of Krypton's heirs living hidden in one refugee's body. Zod: Does Kal-EI need to be alive for us to extract the Codex from his cells? Meanwhile, Zod left his command to Faora-Ul, while he headed for the Arctic scout ship that had orginally signaled them ("to secure the Genesis Chamber and pay my respects to an old friend"). Inside the scout ship, General Zod activated it with his Command Key, and his "old friend" Jor-El appeared once again, cautioning against human genocide: "I will not let you use the Codex like this." Behind Zod was the Genesis Chamber with many unborn Kryptonian fetuses. The obstinate Zod revoked Jor-El's authority, took control of the ship, and vowed: "I will harvest the Codex from your son's corpse, and I will rebuild Krypton atop his bones." Once he had terminated and quarantined Jor-El, his holographic image slowly disappeared from view. Zod launched the scout ship and departed for Metropolis. In the Indian Ocean, Superman fought off the World Engine's liquid metal defense mechanisms in the shape of a snake with long tentacles. Although he would be weakened, he was able to destroy the Engine by flying into the gravity beam and severing its connection to the Black Zero. The Engine blew up and created a massive fireball. Back in Metropolis, the Black Zero's defenses and the gravity beam made it impossible for the fighter jets and the Air Force's C-17 transport to get close enough to launch the space-pod. However, once the Engine was destroyed in the Indian Ocean and the gravitational beam was severed, the military forces were able to penetrate further. When Zod arrived back in Metropolis in the scout ship, he attempted to destroy the C-17 transport and ordered: "Target that aircraft!" Suddenly, Superman zoomed into view and crashed into Zod's spacecraft to deflect it away. Zod yelled: "If you destroy this ship, you destroy Krypton." Clark shouted back: "Krypton had its chance," and then used his heat-vision to split the ship in two, and cause it to crash (and fracture open the Genesis Chamber), with Zod inside. While Faora-Ul counter-attacked in a separate drop-ship fighter and boarded the C-17 transport, the Air Force plane tilted downward to prepare to release the space-pod - and Lois was thrown onto the opened back end of the plane before she eventually fell off. Realizing he was on a sacrificial suicide mission and couldn't stop Faora-Ul, Colonel Hardy piloted the C-17 directly into the Black Zero (he repeated a phrase to Faora before the impact: "A good death is its own reward"). The force of the collision between the two Phantom Drives - one in Kal-El's space-pod and one in the Black Zero - caused the temporary "black hole singularity" to develop - and everything was sucked inward toward the portal to the Phantom Zone. Superman again saved Lois from hitting the ground and from being taken into the black hole. Enraged, General Zod (the sole Kryptonite survivor) emerged from the metal debris of the crashed scout ship amidst the utter destruction of Metropolis. During a confrontation with Superman, he vengefully vowed to kill all of humanity for the greater good of Krypton. They began a monumental, devastating battle across Metropolis, and as the two aliens clashed, Zod became stronger (developing heat vision and the ability to fly) as he adapted to Earth's atmosphere, and he shed his heavy armored suit. After the destruction of several skyscrapers, structures, and even a space satellite, they fought to a stand-still. Inside Metropolis' central train station, the monstrous Zod threatened to slaughter an innocent family of passengers with his heat-vision: "If you love these people so much, you can mourn for them." Frustrated and with no other option, Superman was forced to kill Zod by snapping his neck. Lois comforted and consoled him for eliminating one of the last Kryptonites. Later, it was revealed that military surveillance drones had been deployed to track down Superman's whereabouts. To express his displeasure, Superman crashed one of the Air Force's expensive drones directly into the path of a car carrying General Swanwick and Major Carrie Farris (Christina Wren). Swanwick expressed his fears: "How do we know you won't one day act against America's interests?" Superman attempted to reassure the General that he could be trusted and would not turn against humanity, while insisting on acting independently and on his own terms. He also pressured Swanwick to convince the government of his good intentions: "I grew up in Kansas, General. I'm about as American as it gets. Look, I'm here to help but it has to be on my own terms. And you have to convince Washington of that." Then, after Superman flew away, Swanwick noticed that Major Farris was enamoured of Superman: "I just think he's kind of hot." The concluding scene was at the Smallville cemetery, where Clark and Martha visited Jonathan's gravesite, and she spoke of his intentions: "He always believed you were meant for greater things. And that when the day came, your shoulders would be able to bear the weight." Clark expressed his regret that his father did not see his accomplishments, but Martha answered: 'He saw it, Clark, believe me." [There was a brief flashback to Clark when he was 9 years old, and play-acting with a cape on his back, while Jonathan watched him with pride.] Clark then stated that he would take an unassuming job that would allow him to keep informed, visit dangerous places or situations, and ask questions. In the next short epilogue, an unidentified employee arrived at the Daily Planet office building. He was introduced as the "new stringer" - a freelance reporter named Clark Kent who wore black-rimmed glasses as a disguise, although Lois clearly knew Clark's secrets and history. This expensive blockbuster, directed by Zack Snyder, occurred on the 75th anniversary of the DC Comics hero (from 1938). It was the second reboot (or pseudo-sequel) of the original Christopher Reeve series of four films (a nine year span from 1978 to 1987). The earlier reboot was an homage sequel titled Superman Returns (2006) with a different star playing Superman, Brandon Routh. The story line began with an explanation of Superman's origin story. The modernized role of Superman was now played by Henry Cavill, while Amy Adams took on the character of Pulitzer Prize-winning reporter Lois Lane. Russell Crowe performed in the role of Superman's (Kal-El) Kryptonite father Jor-El (played earlier by Marlon Brando), and Michael Shannon portrayed villainous General Zod on Krypton. Superman's adoptive earthling parents were the Kents (a Kansas farm couple Jonathan and Martha), who were portrayed by Diane Lane and Kevin Costner, and Daily Planet boss Perry White was played by Laurence Fishburne. It was set 18 months before its sequel, Batman v Superman: Dawn of Justice (2016). With a production budget of $225 million, and box-office gross receipts of $291 million (domestic) and $668 million (worldwide). 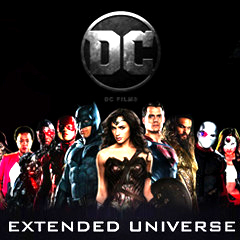 Chronologically, this was the 1st film in the DC Extended Universe series of films. Of the first five films in the series, it was the 4th most profitable film, only besting Justice League (2017). At the time of its release, it was also the highest-grossing solo Superman film ever. After the lukewarm reception for WB's previous rebooted film Superman Returns (2006), it was imperative that this film rejuvenate and revamp the series. Its success boded well - it set the stage for the upcoming Warner Bros.' Batman v Superman: Dawn of Justice (2016) and another franchise, starting with Justice League (2017). There were no Academy Award nominations for the film. At the MTV Awards, Henry Cavill won the Best Hero Award.